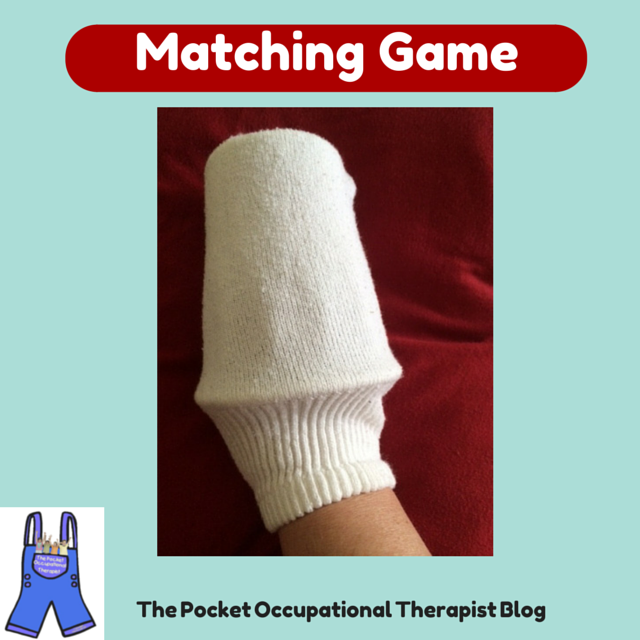 A fun tactile matching activity called STEREOGNOSIS! Stereognosa what? Stereognosis involves using your sense of touch to feel for and identify /recognize an item that’s hidden from view. An example is when you reach into your purse on the passenger seat at a red light to feel for your lipstick. While your fingers search for the lipstick, you feel your wallet, coins, and makeup case without visually seeing them. The cool thing is that each object has a different shape, size, texture, temperature, weight, etc. and our fingers’ awesome skills are able to “read” that object to send enough information to the brain to make an accurate identification! Why do we need to work with this? Many children need to look at items in order to identify them. They may need extra practice with this skill. So, when kids are buttoning a button, they need to feel for the button and differentiate it from the buttonhole. As we improve our skills, we can complete buttons, zips, and snaps faster and faster until the skill becomes almost automatic. Here’s a FUN way to practice the skill of Stereognosis using household items! Gather two of many objects in your home. I like to use items with different textures such as cotton balls, marbles, keys, rubber bands, paper clips jingle bells, poker chips, buttons, spools of thread, screws, plastic spoons, and golf tees. Use age-appropriate items to avoid any choking hazards. Be creative and make sure that your child is able to identify the items while looking at them. **This skill involves a familiarity of the item. When we see, touch, and explore an item, our brain stores the information since we may need it at a later time. A child wouldn’t be able to identify a key if she’s never seen or touched one before. Our brains truly are amazing! Put the items into a paper bag or a plastic cup with a sock over it and ask children to put their hand in and choose two items that match. Another variation of the game is to put objects in a line on the table and ask your child to reach into the container and choose the matching item. It’s an awesome game to play with siblings or friends during a playdate. Place a sock over a plastic cup to keep kids from peeking. Make sure to keep working on those snaps, buttons, and zips! There are chapters in both the Parent’s Guide to Occupational Therapist for families of children with special needs AND the Special Needs SCHOOL Survival Guide with tons of additional activities and explanations about stereognosis and other fine motor and sensory skills. Remember that stereognosis is only one part of fine motor and may require a lot of practice. As always, keep any activity motivating for kids and they will be more likely to participate. Have fun! Let me know how this activity works for your child. Looking for more fun and learning activities? Check out my earlier blog post about making emoji hand puppets HERE. I’m a school OT, veteran mom of 4 and have been plying this fun game for years! Love your cup in a sock idea (also use Ned’s head) wondering if there is any standardization for “testing” kids? I recall some standardization of items used for adults in rehab and the number but I have ling since lost that. Do you know of any. Also the original SIPT had a graphesthesia component, is there any protocol that you know of?